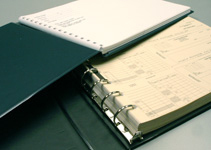 Heavy duty binder holds 500 checks and features a checkbook pocket organizer. Color-coordinated in blue, green, or charcoal. Size: 10" x 14 1/8" x 1 3/4"